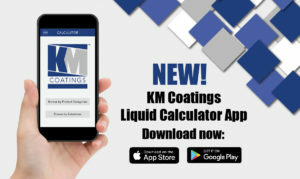 KM Coatings releases its Liquid Calculator App 2.0 for iOS and Android devices. The updated app includes additional capabilities that supports project planning. PHOENIX, AZ. JAN. 6, 2018–KM Coatings, a manufacturer of commercial grade liquid-applied roof systems, announced today the release of its Liquid Calculator App 2.0. The updated app enables roofing contractors to manage projects more efficiently, estimate budget, and save time. Initially launched in 2017, the free app calculates the estimated quantity of the KM Coatings elastomeric coating needed for a roof project. It also has a function that determines the best roof coating system solution based on project parameters. The new version includes waste factor, product information, printing and sharing. The Liquid Calculator App 2.0 is available for iOS and Android devices and can be downloaded at kmcoatings.us.